A team of scientists have announced a major breakthrough in their efforts to develop improved banana and plantain varieties that are resistant to banana streak virus (BSV), one of the diseases hampering the crop’s production in Africa and threatening the food and income of millions of farmers. The team successfully used CRISPR, a powerful technology for genome editing, to develop plantain plants that showed high resistance to the banana streak virus. This is a widespread pathogen that develops chlorotic streaks on leaves that finally leads to death of the plant. This is the first report of generation of a genome-edited crop in Africa. Plantains, and their close relative banana, are important staple food crops in tropical and subtropical countries. However, their production is constrained by a myriad of diseases. The development of improved varieties that are resistant to diseases and pests is vital to ensure healthy and high yields, and for food and income security. The banana streak virus works by integrating its DNA into the B genome of banana and plantain having one or more of the genome. When the plants are stressed – for example, by drought or heat, tissue culture – the viral DNA produces functional viral particles, ultimately causing disease symptoms. Thus, major epidemics caused by BSV are not due to natural transmission through insect vectors or through use of infected planting materials, but rather due to activation of integrated virus under stress conditions such as unfavorable conditions. 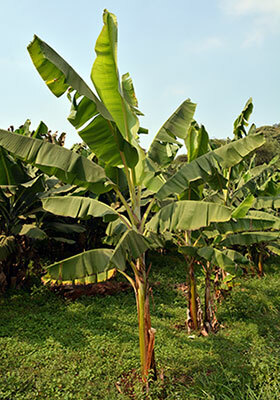 As a result, breeders avoid using banana and plantain that contain the B genome, like the Musa balbisiana, for crop improvement even though they may have positive attributes, such as hardiness, a strong root system, and tolerance to stress. The research team, led by Leena Tripathi, Principal Scientist, at IITA based in Nairobi, Kenya, used the CRISPR/Cas9 system to inactivate viral DNA from the B genome of Gonja Manjaya. The Gonja Manjaya is a variety of false horn plantain of the Musa genus commonly grown in East and Central Africa. The genome edited plants of Gonja were generated and tested by Jaindra Tripathi, a Banana Transformation Specialist and Valentine Ntui, Plant Biotechnologist at IITA-Nairobi in collaboration with University of California, Davis, USA. The team found that, when exposed to drought stress, 75% of the edited plants did not show any symptoms of banana streak virus compared to non-edited plants, which confirmed that viral DNA was deactivated. “This strategy can be applied to improve breeding lines, which can then be used to develop plantain hybrids with no risk of activation of functional virus. The strategy can also enable global dissemination of the resulting hybrids with improved B genome,” says Leena Tripathi. The authors conclude that this strategy could be used to strengthen banana and plantain crops and to develop new hybrids with improved B genome. “Gene-edited products, unlike genetically modified ones, have their genes simply edited such as deletions and they do not have any foreign DNA introduced. They are therefore not regulated in several countries. The gene-edited varieties can be developed and released much more quickly and less costly in comparison to the genetic engineered varieties,” adds Tripathi.